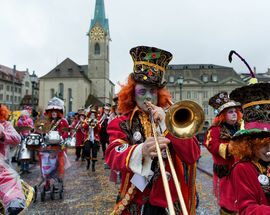 If you run into a crowd of people in wild and wonderful masks and costumes playing horrendously loud music on trumpets, horns and drums – well then you must have stumbled on fasnacht, the Swiss version ofcarnival. 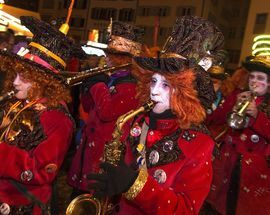 In many Swiss cities fasnacht means colourful processions, big tents with live bands and lots of dancing and partying. 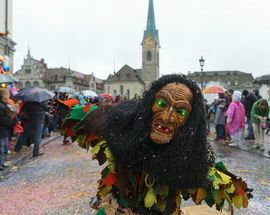 The Swiss carnival called fasnacht is a major event in some cities. 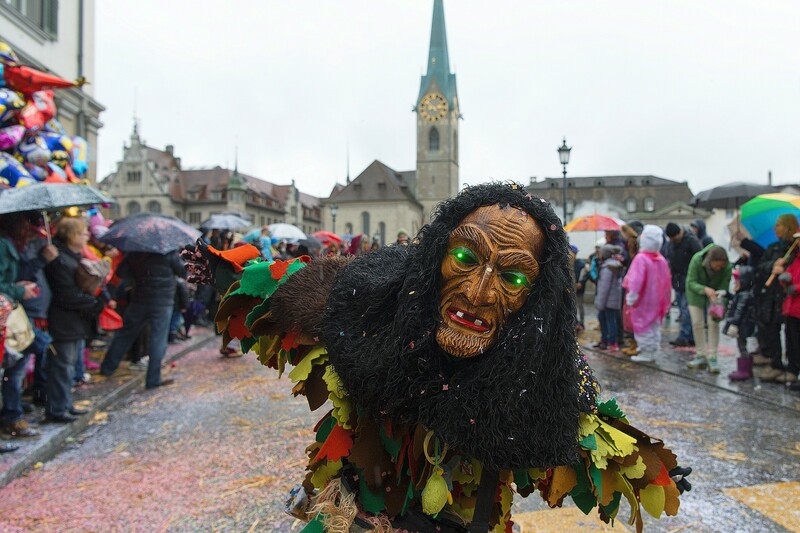 Like Rio has its Samba tradition, several Swiss cities have their own enthusiastically cultivated fasnacht customs. Some people virtually live for this celebration, waiting all year for fasnacht to come, creating new elaborate costumes and rehearsing their music routines in fasnacht-associations. In many places they get their first taste on November 11 at eleven minutes past eleven (11:11 on 11.11), when there is a short outbreak of loud music and people in wild and colourful costumes. But fasnacht proper is in February or March (see the box below for details) and then lasts for a few raucous days. During mediaeval fasnacht everything was turned topsy-turvy, you could make fun of authorities without fearing punishment and parody and satirical humour ran wild. 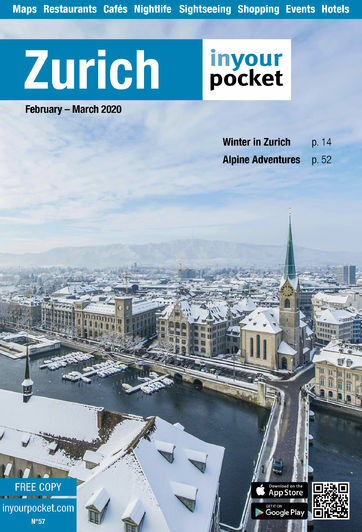 Poking fun at the powerful is a central aspect of modern-day fasnacht, especially in Basel which has the country's biggest carnival. Normal business basically grinds to a halt for three days, as literally everyone is involved. It gets off to a quite poetic start at 4:00 on Monday morning, when all lights are turned off and a procession of huge lanterns floats through the old town, musically accompanied only by pipers and drummers (the morgesträich). Huge crowds come to watch and the railways run special trains from other cities. The lanterns comment on recent events – teasing politicians or e.g. the bosses of the pharmaceutical giants – but the mockery really starts at the so-called schnitzelbänke, where singers perform their teasing verses in bars all through Basel. Unfortunately, even other Swiss miss many of the jokes, as it's all in virtually impenetrable Basel dialect. Luzern also hosts a very big and popular fasnacht (check out our feature about), which starts at 5:00 in the morning on Dirty Thursday (Schmutzige Donschtig), continues with the Fritschi parade in the afternoon and ends on Shrove Tuesday with the so-called Monstercorso, a huge parade of big bands and lanterns in the evening. 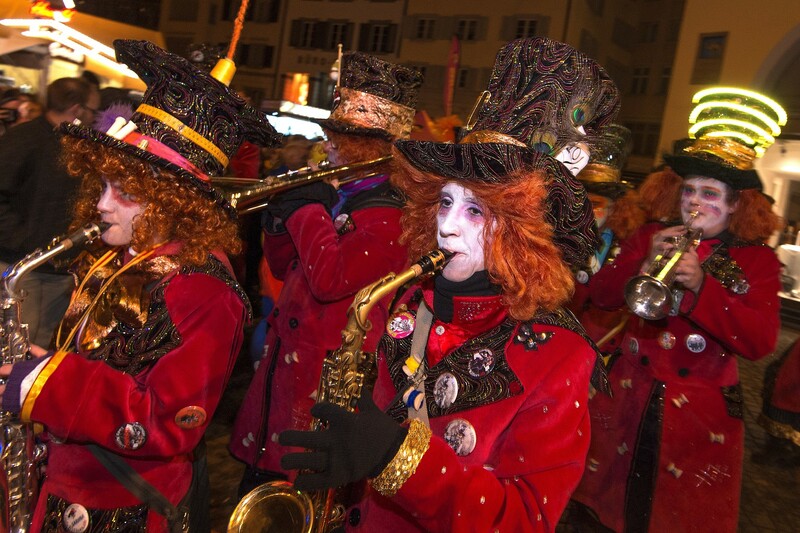 Many firms even close during fasnacht in Luzern, so that everyone can take part! Like Basel, Luzern's streets and bars are packed during fasnacht, with people pouring in from all over the region to get in on the fun. In Zurich, fasnacht is a bit of an enthusiasts' tradition, not quite on a par with sächsilüüte or knabenschiessen. 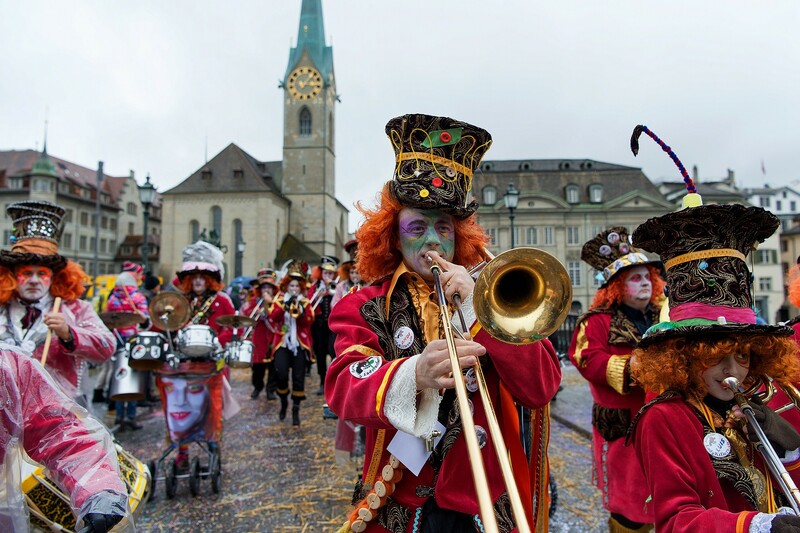 Zurich boasts around two dozen guggen, which is what the fasnacht bands are called. You can hear them at the main parade and at indoor venues. Several beerhalls and bars, especially in Niederdorf, have guggen playing or general fasnacht-ivities. As in other cities you'll see many people at the fasnacht wearing a badge – this is the so-called fasnachts-plakette which is sold on the streets to support the fasnacht organisers and can make a nice souvenir. Party tents with guggen on Münsterhof and Hirschenplatz.